The final field has been revealed for the Hong Kong Vase, and Red Verdon has drawn stall 3. The winner has not emerged from that gate since Dunaden in 2011 and there is some talk that a wider draw can be preferable, but Willie Cazals was runner-up from that berth in 2014 and The Fugue achieved the same position in 2013. Meanwhile Jaguar Mail was beaten a nose from the 3 box in 2012 – by none other than Red Cadeaux. So clearly we cannot grumble too much about where we are drawn. We also have James Doyle back on board, which is exciting news given the rapport that he built with Red Verdon throughout the summer back in England. 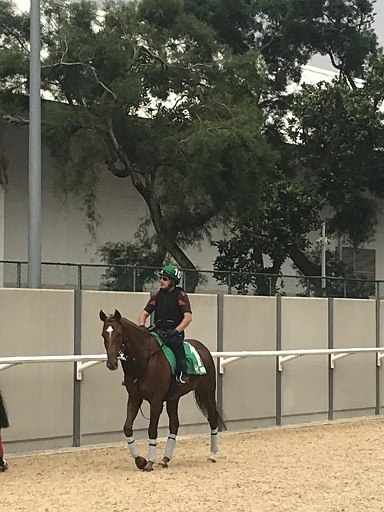 The blinkers the horse wore to great effect in the earlier part of the season and in the Caulfield Cup are retained, and he will also be equipped with a cross noseband. So we are all set, but we do have the odd danger to worry about! Waldgeist, Pakistan Star, Salouen, Exultant, Mirage Dancer, Eagle Way and Latrobe are all officially rated higher than us, whilst the likes Price of Arran, Rostropovich and Crocosmia arrive in superb form having run well in extremely hot international races of late. We will need a lot of luck to trouble the places, but when Red Verdon has been dismissed pre-race before, he has more often than not exceeded expectations come race day. We keep our fingers crossed that he can do the same on Sunday!